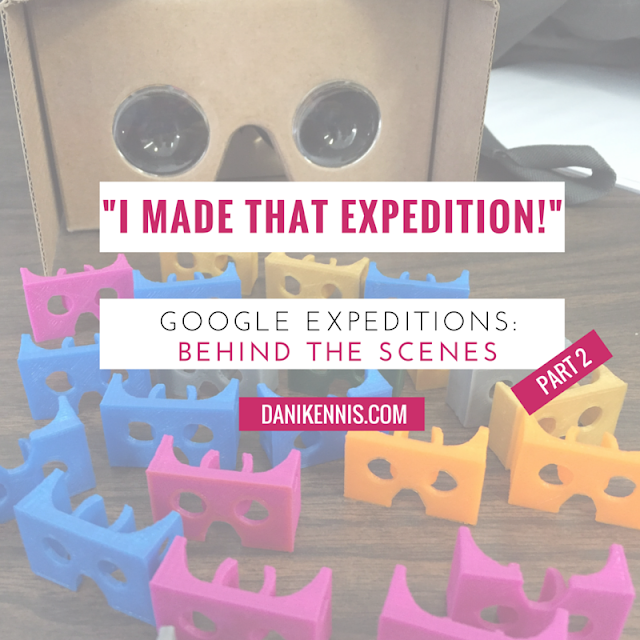 In Behind The Scenes: Google Expeditions: Part 1, I explained my school’s relationship with Google and how I created an Expedition at the Google headquarters in NYC back in 2015. After the Google engineers worked their magic and created the expeditions, it was time to pilot in the classroom with students while engineers and employees from Google observed. In hyping up an already awesome day and creating a true experience for my students, I challenged them to dress up as tourists. I even made them fake passports with their names and pictures on it, which they loved! It made the entire experience that much more authentic, enjoyable, and memorable. Many of the students in my Special Ed classes struggle with engagement, motivation, and communication, in addition to behavioral, emotional and learning disabilities. However, on Pilot Day when students looked into the Cardboard and a chorus of ‘OH MY GOSH’ filled the room, 100% of them were engaged and immediately drawn into the lesson for the entire class period! To facilitate a valuable learning experience, the day before Expeditions was spent reviewing major architectural themes and accomplishments from the Classical Greek and Roman civilizations, comparing and contrasting it to the art and architecture of the Middle Ages. Taking the time to build and focus on that knowledge was crucial in seamlessly implementing Expeditions and facilitating rich and meaningful connections with content material. As the lesson continued we alternated between using the viewfinder to look at images and asking/answering discussion questions that I had pre-made based on each specific site on the Expedition. The ‘Pause’ feature on the tablet proved to be invaluable, as it allowed me to refocus my students and draw them back to the topic despite the high levels of excitement and energy in the room. With that said, it was incredibly powerful to watch students connecting with the imagery on the screen and to observe their excitement as they saw tangible evidence from the topics we had discussed. Then Google asked my students for feedback. Knowing that their opinions were being listened to and valued had each and every student participating on a level that was unprecedented. It served as a reminder of how essential it is to elevate student voice and empowerment within my classroom on a regular basis. I was blown away with the feedback they provided especially students who were typically reserved and quiet. They suggested adding video, a head strap to the Cardboard viewfinder, a voiceover or guide for each slide, music, and they requested the ability to create their own Expeditions. This last suggestion was what students were most passionate about, which comes up in just about every session I run on Expeditions. Since the pilot, I have been fortunate enough to continue my work with Expeditions. Last June, I attended ISTE with Google and presented numerous sessions on Expeditions. It was absolutely amazing to see educators and adults from all over the world step into virtual reality for the first time. Then, in the fall, I attended the ECET2 conference in which the incredible Jonathan Rochelle was leading a session on Expeditions. I chimed in and asked, "Do you have an Expedition on the Middle Ages? I made that!" A few months later JR and I presented together at a conference in New Jersey, which was truly an awesome experience! More recently my school has continued working with Google to facilitate the Expeditions Pioneer Program within my district in which students in grades K-12 (and staff!) got to try out Expeditions and, of course, loved it. Jonathan Rochelle and I presenting together on Google Expeditions. In a completely ironic timing of events, as I write this I just had one of last year’s students stop by my class to say hi. He told me, ‘Exactly one year ago today was the best day of school ever! It was Google Expeditions day and I will never forget how much fun that was!’ Knowing that I (well, really Google) provided my students with a memorable learning experience that stayed with them is what school is all about! Virtual reality experiences such as Google Expeditions and other #edtech resources can be powerful supplemental tools that afford our students with interactive, hands-on experiences that redefine what school is and should be. 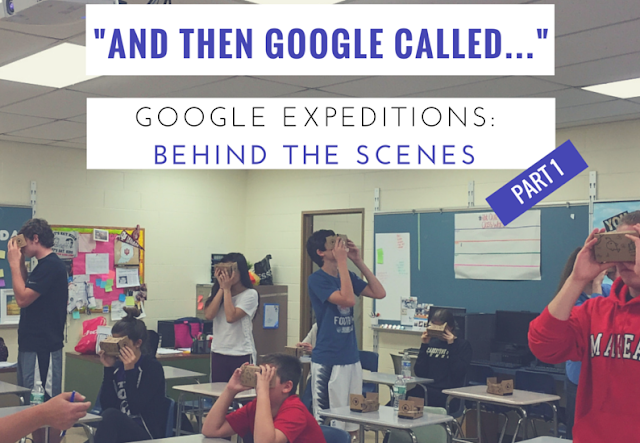 How do you think #GoogleExpeditions & #edtech have redefined what school is and should be? I am incredibly fortunate to work in a district that has a strong working relationship with Google Apps for Education, which has afforded me the opportunity to take part in pilots for various Google products over the past year. The coolest pilot I have been a part of, by far, was Google Expeditions. If you haven’t heard all the recent buzz on Expeditions, it is a virtual reality field trip that ‘takes you places a school bus can’t.’ The best comparison I have found is to compare Google Cardboard and Expeditions to everyone’s favorite 80s toy, the ViewMaster. “Choose a topic you will be teaching about in the next few months. You will be designing a virtual reality field trip around it.” I chose to make an Expedition about the Middle Ages/Renaissance architecture in Europe. Using Google Slides we compiled panoramic photospheric images for the various points of interest we wanted to include on the virtual field trips. In all honesty, it was very difficult to find good imagery for the things we wanted to show, which was really the only tough part about this entire experience. A note about this: As teachers, many of us are used to working within specific parameters and following certain established rules. The culture of Google is very different than the culture of your traditional classroom - Something I have grown to highly respect and admire. Google’s ‘fail often and fail fast’ motto lent itself to directions being intentionally vague in hopes that we would create products that were truly authentic and genuine. Next, we finalized our presentations and provided summaries of each destination on our Expeditions. This is what you’ll see when you are on the teacher/guide side of Expeditions. When holding the tablet to lead an Expedition, if you tap on the tab on the right side of the screen you have access in depth information and scaffolded questions to pose to your audience. This feature makes the tool content area agnostic so that a world language teacher can potentially lead an Expedition on Biology, for example. After this step, it was time for the engineers to work their magic! I’m not sure how long it actually took the Google engineers to ‘make’ the Expeditions so that they were pilot-ready, but it felt Easy Bake Oven-esque in that we shared our slide decks and the engineers turned them into this magical product that had the power of capturing 100% of the attention of every single person that put it up to their eyes for the very first time. Stay tuned for the second part of the Google Expeditions journey in which Google came into my classroom and tested Expeditions with my awesome Special Education students! "What Stuck With You Today?" - The upscale exit ticket.